“Seven teens attacked by grizzly in Alaska’s Talkeetna Mountains,” reads a headline in a Sacramento news story, taken from the Anchorage Daily News on July 25, 2011. And, “Two teenagers have life-threatening injuries after being mauled by a grizzly bear while on a survival skills course in the Alaskan wilderness,” the first line of a Guardian feature informs us. The italics on the words “mountains” and “wilderness” above, however, are mine. I think it noteworthy where these events took place. Against our ever-increasing penchant for developing remote areas and fragmenting wildlife corridors, the world’s largest predators have been squeezed onto smaller and smaller pockets, with nowhere to go but the mountains and the wilderness. Today, grizzlies, wolves, tigers and lions are having trouble finding room to be grizzlies, wolves, tigers and lions. And, without them, our planet is in big trouble. But given our current relationship with top predators, is there any way we can make room for them in our lives? When nonhuman animals and humans collide, it is almost invariably the nonhuman animals that suffer. Just look at the two news stories mentioned above, where words like “attacked” and “mauled” are used. The teenagers inadvertently surprised the grizzly, who had a cub, and its actions were most likely “protective”—at least from the animal’s point of view—rather than combative. 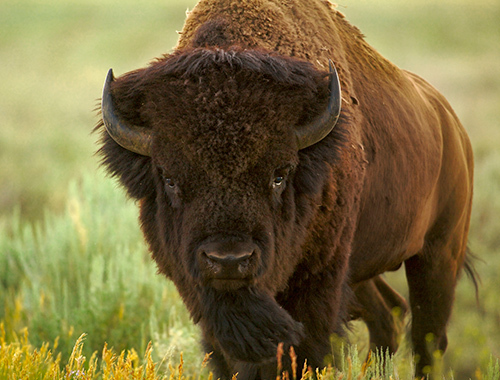 That kind of verbiage echoes a similar, recent event in Yellowstone National Park, where a bison “gored” a woman who was purposely striding toward it, in what could have been interpreted by the animal as an aggressive act. According to James Estes, a marine ecologist and evolutionary biologist at the University of California Santa Cruz and the lead author of the NSF report, the decline of the world’s largest predators—largely due to hunting and habitat fragmentation—has far more devastating consequences than just a diminishing of a species’ population numbers. An ecosystem’s vegetation, wildfire frequency, infectious diseases, invasive plants and animals, water quality and nutrient cycles are all impacted when a top predator is removed. When a change at the top of the food chain triggers a string of effects that moves down through the descending levels, the term “trophic cascade” is used. 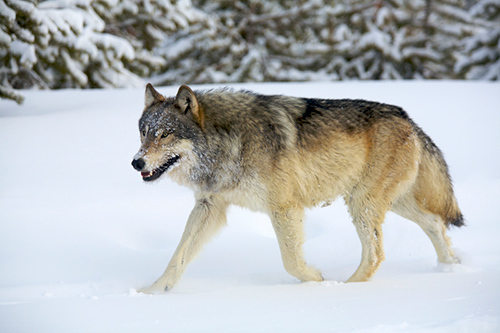 For example, the extirpation of wolves in Yellowstone National Park led to overbrowsing of aspen and willows by elk; the reintroduction of wolves allowed the vegetation to recover. When sea otter populations plummeted, coastal ecosystems suffered dramatic changes. Sea otters maintain coastal kelp forests by controlling the number of kelp-grazing sea urchins. And the decimation of sharks caused an outbreak of cow-nosed rays and the collapse of shellfish populations in many estuarine habitats. 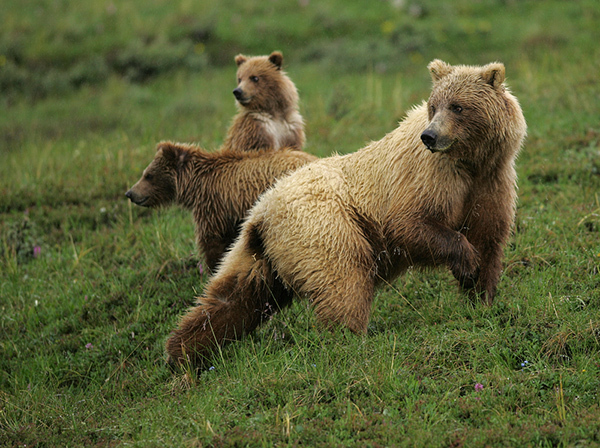 Unfortunately, large predators such as grizzly bears and wolves can’t survive on an acre of land. These types of animals need large territories, so making sure they have enough room to go about their livelihoods often conflicts with human needs and goals. Leaving wilderness areas in Alaska or Montana or Nebraska undeveloped might mean doing without another oil pipeline. Letting the mountains be “mountains” might mean forgoing another mine. In my own state of Wisconsin, I have watched as more and more people move into the Northwoods. Many of the newcomers feel there are too many wolves here (about 800) and that having them nearby is just too dangerous. The wolves have to go. But if the goal of conservation is to restore functional ecosystems, then it would seem that protecting and keeping an area’s large predators is fundamental. The question is: Would you mind living next door to a predator? Great article! You’ve make points critical for others to understand. Unfortunately, our world is not currently set up to let the predators be predators very well. As it is mostly the case that the animals were present first, wouldn’t it be fairer to ask if the predators mind living next to humans? I feel the same. If the birds eat a few berries it’s ok. and if the deer eat the day lily–I am just trespassing on their habitat. I can find food far more easily than they can. I mind my own biz. and they generally mind theirs. What happened in Alaska–not a state to be mindful-if a rifle or air borne killing machine is available–is an accident of being in the wrong place. A mother creature will commonly protect her offspring if she feels a threat. Mankind is a threat. It is totally predictable. These creatures should have their territory respected even when it is urban due to development. Could I live next door to a area with the top predators ? Yes, I would love to! There is a great documentary called, Lords Of Nature, that you can purchase that shows what happens when the top predators are missing from the ecosytem. I grew up in southern Ontario where we don’t have predators (people likely rid our area of them when they cleared the land many years ago), so I’m not used to these animals and being in their regions when we travel certainly makes me nervous. But I understand those are their homes and we need to be considerate of that. I agree with the comments above. Our bears in NJ are far less aggressive than grizzlies, but they come into the yard now that I don’t have a dog. We have coyotes and bobcats and probably cougars, although the state Division of Fish and Wildlife says we don’t. They bother some people, but I figure the land belongs to them. You don’t leave garbage out. You give them a wide berth. They have rights too. We live in the forest, therefore we occupy land that also hosts predators. A year ago, we were just people from suburbia in SoCal. Today we are still entranced by nature that surrounds us. It is intoxicating! I do live with predators. Cougars, black bears and the occasional grizzly. After 30 years out here we’ve got used to them and we have more than anyone else around here as we only have cats, no dogs. Newcomers always want them removed even though these people have moved into the animals’ territories. People have unrealistic expectations about what wilderness living is really like!